Galwayman Ciarán Stewart was named ‘Franchisee of the Year’ and Eyre Square branch manager Rajen Subramamiam named ‘Manager of the Year’ Award at the Supermac’s All Stars Awards event in the Loughrea Hotel and Spa last week. Ciaran operates stores in Tullamore, Navan and Drogheda while Rajen is the manager at the Supermac’s Eyre Square branch. They received their awards for outstanding achievement in service, operations, marketing and public relations. In all there were 18 awards handed out on the night covering Supermac’s, Papa John’s and SuperSubs. Ciaran Stewart started with Supermac’s in 1995 at the Headford Road branch. He quickly progressed to the position of Assistant Manager in 1997. Following this he was appointed store manager in 1999 and Ciarán was promoted to the position of Area Manager for Galway in 2001 with responsibility for 8 stores in Galway city and county. In 2006 Ciaran was appointed Operations Manager for Papa John’s Pizza in Ireland where he was responsible for the growth and development of Papa John’s in the Irish market. Ciarán is a franchisee with Supermac’s since 2010. He currently has stores in Tullamore, Drogheda and Navan employing approximately 120 staff. 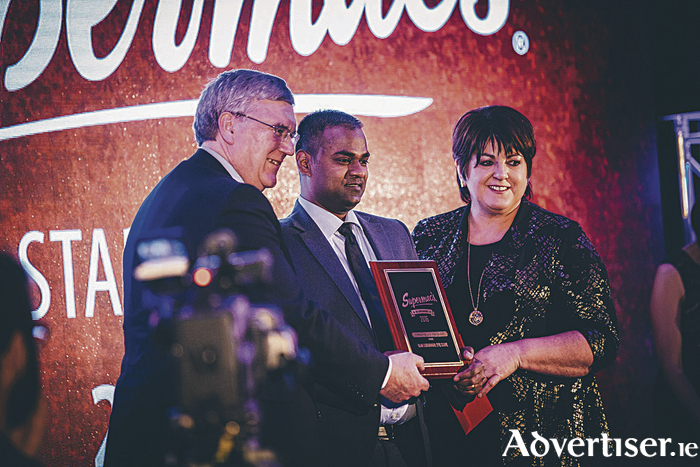 Rajen started with Supermac’s in 2004 and quickly progressed to the position of Assistant Manager in Eyre Square. Following this he was appointed Store Manager in 2011 and has held that position in the flagship Supermac’s store since. In his time in Eyre Square he has been involved in the development of Papa John’s Pizza and SuperSubs in the store. Speaking at the event Supermac’s MD, Pat McDonagh, paid tribute to the Supermacs’s team. “Being the Supermac’s Franchisee and Manager of the Year doesn’t happen by accident. They have taken the opportunities that come their way and met the challenges they faced to develop a very successful business. “I would like to congratulate Ciaran Stewart and his staff on winning the Franchisee of the Year award and I know that he and his team will go from strength to strength,” he said. “Rajen has gone from strength to strength since he stared with us in 2004. Our Eyre Square store is one of the busiest in the country and Rajen has proven himself more than capable of managing and leading a team to provide consistent, high quality food and service to our customers. “I would like to congratulate all the winners and their teams on winning their awards and I know that they will continue to provide the quality of service that our customers deserve,” he said. Supermac’s is one of Ireland’s largest indigenous quick service restaurant chains. It was founded in 1978 by Pat McDonagh, a Galway native, when he opened the very first outlet on Main Street, Ballinasloe. The franchise currently has over 100 outlets across the Republic and Northern Ireland, including the new Charlestown Service Station on the N17.